An action plan to protect our endangered tiger is finally on the table, and it aims to raise tiger numbers to 1,000 by the year 2020. LAST week, the gory photograph of four tigers with their heads cut off stared out from the pages of the Bangkok Post. Thai Police, who discovered the gruesome bounty in a truck in Hua Hin, said the load originated in Malaysia and was headed for China. The case is just the latest in an alarming spate of cross-border wildlife crime. Last June, Thai customs officers seized the carcasses of a tiger, a clouded leopard and a panther at the Padang Besar checkpoint. The offender escaped by fleeing back to Malaysia. In June 2006, police in Bangkok found smuggled wildlife, including the remains of six tigers, in the cargo of a flight from the Thai-Malaysian border town of Haadyai. They may be fierce and strong, yet tigers are no match for man’s greed. Tigers once ruled the wild. Today, only 500 is said to remain – a 1990s estimate that is questionable, seeing the numerous threats that this majestic big cat faces. Apart from poachers, tigers are losing their forested homes to expanding agriculture, killed by angry farmers and villagers, and losing their food to game hunters. These perils put urgency to the newly released National Tiger Action Plan, which spells out the actions needed for the next seven years in order to boost tiger numbers. The goal is to double current tiger numbers to 1,000 by the year 2020, and for these cats to thrive in the Central Forest Spine, a mosaic of forests running the length of the peninsula. This milestone in wildlife conservation demands measures ranging from securing and expanding tiger refuge to better forestry management, waging war on poachers, protecting tiger preys, wise land use to overcome man-tiger clashes and creating an informed public. The plan is the effort of the Malaysian Conservation Alliance for Tigers (Mycat), a collaboration between Wildlife and National Parks Department (Perhilitan), Malaysian Nature Society, Traffic South-East Asia, Wildlife Conservation Society and World Wide Fund for Nature-Malaysia. Tigers now cling on to only a small slice of their former domain and much of this is unprotected or broken up by highways, railways, settlements and farms. To secure a sizeable home for tigers, the Tiger Action Plan wants expansion of parks and wildlife sanctuaries, such as by including Temenggor forest reserve in Perak. A noted key habitat for tiger survival, it is now being logged. The plan does not dismiss wild habitats located outside protected areas in the rescue scheme for tigers, especially since 85% of suitable tiger habitat lies within Permanent Reserved Forests (PRF), which are forests earmarked for logging and which make up 36% of peninsular lands. Furthermore, most protected areas are too small to support viable tiger populations; the 42 parks and wildlife sanctuaries in the peninsula make up only 6% of its land area. Wildlife experts say if PRF are managed sustainably – such as through selective logging which theoretically should leave a forest pretty much intact and does little damage to residual trees and the landscape – they can form important shelters for tigers. World Wide Fund for Nature (WWF) biologist Reuben Clements says enforcement in PRF must be stepped up to prevent encroachment and poaching. “Businesses that impact tiger habitats (for instance, plantations) must be made aware of the Tiger Action Plan and the risks of man-tiger conflicts,” he says. Just as important, states the plan, are vegetated corridors linking major tiger havens and forest pockets. Isolated tiger groups will then have safe passage to a larger habitat and can mingle, ensuring a healthy, genetically diverse population. To boost tiger numbers, the plan calls for wildlife laws with bite. Now, sale of Chinese folk medicines containing tiger derivatives continues due to a legal omission – the Protection of Wildlife Act forbids trade in parts of protected animals but is silent on processed medicines containing non-readily recognisable parts and derivatives. Wildlife experts are hopeful that the ongoing review of the Act will plug its numerous loopholes and provide for higher penalties. No offenders have been slapped with the maximum penalty of a RM15,000 fine and five years’ inprisonment. 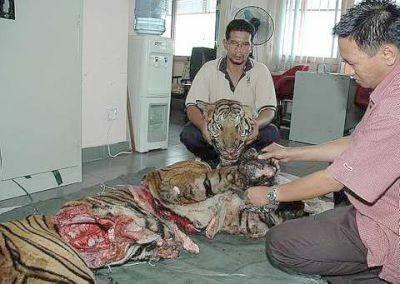 Instead, a man caught with one tiger skull, 31 tiger claws and 10 tiger canines was fined a paltry RM3,000 in 2003, way below the market value of these items. And the 2005 case of a man in Tumpat who had a butchered tiger in his freezer? He was fined a mere RM7,000. Poachers have been depleting Malaysian forests of its wildlife for years. Many, including foreigners, have been caught but the pilfering persists. In early November, wildlife staff found a staggering 500 snares in Taman Negara National Park. Wildlife poaching is a menace which can inflict the most harm in the shortest time. To curb wildlife crime, the plan promises enhanced intelligence-driven anti-poaching patrol, imposing wildlife laws, more trained staff and equipment, as well as inter-agency collaboration. Perhilitan, for instance, will team up with the Forestry Department for spot-checks at logging concessions and work with local authorities to revoke the business licences of restaurants and traditional medicine shops that violate wildlife laws. Tiger density depends very much upon the abundance of large preys such as wild pigs, barking deer and sambar deer. Unfortunately, scientists believe these game species, which can be legally hunted with a Perhilitan-issued licence, are being over-hunted, thus depriving tigers of a food source. “The sambar deer is in a precarious position. Camera traps set up in forests hardly capture photographs of these deer. Even hunters say they no longer get them,” says WWF’s Clements. The IUCN-World Conservation Union late last year moved the sambar deer onto its list of endangered species. The butchered tiger found in the freezer of a home in Tumpat in 2005. The offender was fined RM7,000. The plan wants a moratorium on hunting licences for prey species, pending population studies to determine if they need to be upgraded to the “totally protected” status where they cannot be hunted. With tiger territory in short supply, tigers prowl forest edges and often end up in plantations and livestock farms. In Terengganu, tigers killed 309 cattle annually from 1999 to 2003. Between 1979 and 2006, they mauled 31 people (many were rubber tappers), killing 15 of them. Since 1991, authorities have shot 13 tigers over such attacks and over the past decade, captured and sent 22 to Zoo Melaka and three to Zoo Taiping. What goes unrecorded is the number of tigers shot by angry as well as fearful villagers and farmers. “Trapping tigers is an unsuitable mitigation measure in the long run as it does not address the root cause of human-tiger conflict, which is mainly caused by improper land use planning and unregulated hunting of tiger prey,” says WWF chief executive officer Datuk Dr Dionysius Sharma. To curb such “human-tiger conflict”, the plan proposes ecologically sound land use. 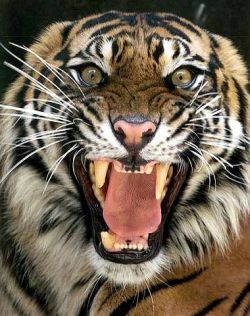 This includes siting plantations and animal farms away from tiger territories and keeping both apart with buffer zones. Land owners will also have to ensure that their activities are compatible with tiger conservation. Sharma says agricultural “best management practices” have also proven helpful in curbing tiger attacks, and include measures such as confining livestock in paddocks from dawn to dusk when tigers are most active, clearing estates and villages of undergrowth to improve visibility, and using air horns to ward off tigers. With some 80 measures requiring action from a myriad of parties – Perhilitan, wildlife groups and agencies such as the Economic Planning Unit, Natural Resources and Environment Ministry, Town and Country Planning Department, Forestry Department and state park corporations – the plan runs the risk of implementation hurdles. And what’s to prevent the plan from ending up like numerous other well-intentioned action plans – collecting dust on book shelves? One foreseen obstacle is getting state governments to abide by Federal Government policies pertaining to land use and natural resources. To counter such possible glitches, the Mycat secretariat is tasked with monitoring progress and an independent audit is also planned. Still, the tiger saviours can expect a difficult task ahead for even as the plan is being made known, the slaughter of tigers continues and their habitats are dwindling. The Tembat forest reserve in Trengganu which forms part of the important corridor linking Belum-Temenggor and Taman Negara, is being logged to build the Puah and Tembat dams. The East-West Highway which cuts a once massive forest into two disparate halves, Belum and Temenggor, poses a new threat: acacia plantations now flank the road and more, including for oil palm, are being planned. “They will further eat into tiger habitats and hinder animal movements between Belum and Temenggor,” warns Malaysian Nature Society science officer Kanitha Krishnasamy. Faced with these grave threats, Mycat partners are urging for greater commitment, collaboration and haste to put the plan into practice. “The plan is excellent but will only be effective if carried out. Having NGOs and the Government working together is key to this action plan being successful. I don’t think any organisation or agency can save the tiger on their own,” says Traffic’s Shepherd. Tigers are a top predator and an umbrella species that indicates the health of forests. Given their need for good forest cover, clean water and a healthy prey population, tiger protection inherently benefits entire forest ecosystems. So shielding the tiger means shielding all other wildlife. Is that so difficult to grasp?